Will #GameOfThrones Season 6 Air Before #TheWindsOfWinter Is Released? The Answer Is Not Here. 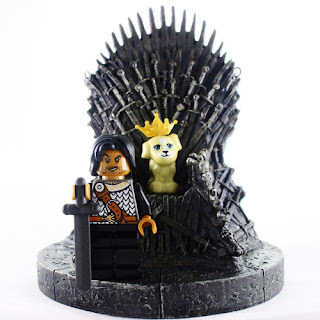 Before this month ends for my timezone, I will have to continue my series of LEGO photos, spoiling the ongoing television series Game of Thrones. This blog is now in the second half of the third season. My Instagram is a couple episodes into the fourth season because I post a new spoiler photo every Sunday. 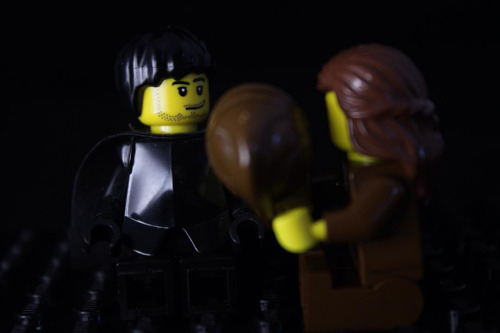 I don't remember why I chose to depict this shot from "The Climb" with LEGO minifigures representing Samwell Tarly, Craster's daughter-wife Gilly, and her as-yet unnamed baby (Little Sam). Perhaps I was pressed for time that Sunday, and I needed to just assemble a couple of minifigures with a very minimalist background. 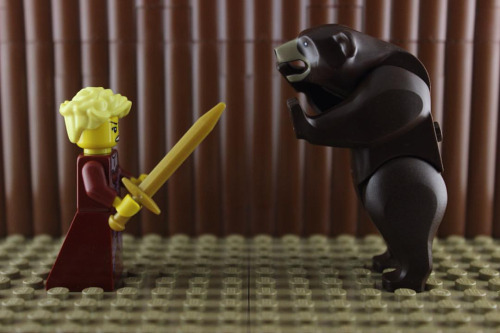 For "The Bear and the Maiden Fair," there was only one shot that I wanted to re-create -- a big bear versus Brienne (the maiden fair). Not counting the minifigures, there were basically about a dozen pieces to create the fighting pit. 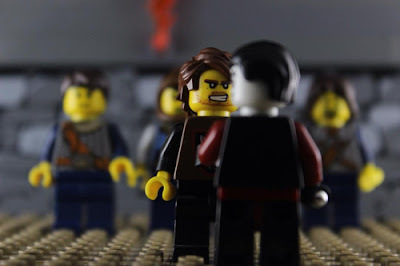 I have neither the time nor the skill to build detailed models in LEGO. I aim for effectiveness in relating the scene, though. Hopefully these photos are effective enough. I guess this scene from "Second Sons" is the payoff from the simple photograph from a couple episodes back. 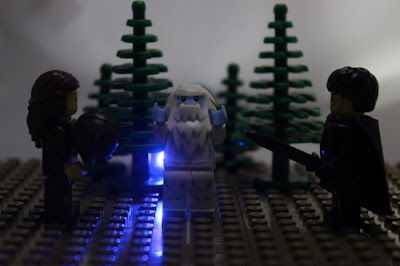 Here, Samwell becomes Sam the Slayer by killing a White Walker to protect Gilly and the still-unnamed Little Sam. (Little Sam officially becomes Little Sam when they reach Castle Black.) A LEGO yeti makes for a decent White Walker, and I used a Doctor Who Sonic Screwdriver to try to back light the scene. Thus far, I have cobbled together minifigures to represent Ned, Catelyn, Sansa, Arya, Bran, and Rickon Stark. And Jon Snow. Even Hodor. I have yet to depict a living Robb Stark, and "The Rains of Castamere" (spoilers!) was last opportunity to do so. I depicted Roose Bolton with a Dracula-esque head to reference the speculation among A Song of Ice and Fire book readers that Roose is the equivalent to a vampire, in George R.R. Martin's fantasy world. 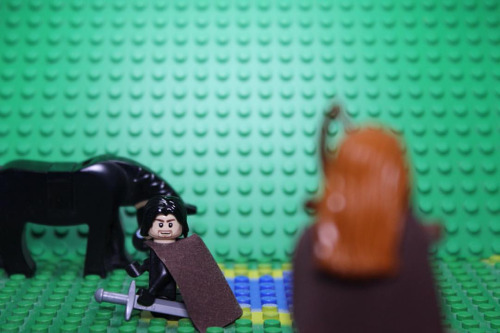 The third season finale, "Mhysa," continues my quest for simple, yet effective Game of Thrones scenes: Two minifigures (Jon Snow and Ygritte), two baseplates, and a horse.